I’ve written up a short introduction on how to try creating your own digital drawing tool in Processing. However it’s over at my .com site, because, I don’t know, I actually managed to snag a .com for the domain name that I’ve had a .org of for years and years now, and publishing an app seemed like a good occasion to make use of it. Quick, go check out this other post before I start sleep-deprived rambling even more here. Go! The generative drawing app that I’ve been working on for the last few months has finally gone live on the Google Play store for Android. Swarmpaint is an extension of ideas that took root back before I switched to a teaching career. I was taking New Media classes (taught by Kenneth Newby, an excellent and interesting artist and teacher) and came across the idea of “computational expresssionism“. If we take on computational tools as a drawing medium, then by designing our own software we can use computation as an additional way of shaping and expressing what we draw. More recently, I just taught a Digital Media Arts course at a local middle school. One assignment had students using Scratch to generate their own visual art. The results were often chaotic, but they often stumbled upon something truly amazing. After a while I realized we could easily turn this assignment into a drawing program by having it follow the mouse. A few students even discovered this themselves (if my shaky memory serves me). And it was amazing how easily we could turn a boring line into something fantastic just by adding a few command blocks. This inspired me to return to my own computational expressionism sketches from those four-or-so years ago and see what I could do with them on Android. In the end, I overhauled the actual drawing engine to something more physics-y, added a lot of controls and hopefully enough polish that you all agree it’s worth the (really cheap!) price of admission. So, I invite you all to try out a taste of what a computational drawing medium could let you do. And if you’re curious about how to make a computational drawing tool truly your own, keep an eye out here or let me know on Twitter as I’m considering putting some sample code online to get people started. Last year, I started off a new Digital Media Arts (DMA) program at a local middle school. Here’s a rundown of how I laid out the class, what worked, what I had to tweak as I went, and what might be worth trying or extending next time. First, some context. DMA isn’t a course that’s prescribed by the Ministry exactly; it’s a fairly common inclusion with a middle school’s courses around here, often as part of an ‘Explorations’ set of classes that includes Fine Arts, Woodworking / Trades, Cooking, etc. It’s sometimes taught as a Fine Art class and targeting those learning outcomes. In my case, however, the class was brought in as part of our school’s Tech hours for the IB Middle Years Program. What this added up to was a class fulfilling Tech hours but with an Arts spin, and with almost no prescribed learning outcomes. I had space to make this into what I wanted. I’d found examples of other IB MYP schools using Tech hours to simply do straight-up digital art, eg. a unit on Photoshop. I tossed ideas around for a while and in talking with other Explorations teachers I realized that I should focus on my passion – getting kids doing some fun coding. Scratch fit this perfectly, and so that became the focus for my DMA Year One. The class would run for about 30 hrs per group of kids, with three 1-hr-long classes per week and three semesters of kids rotating through. So, enough time to cover one thing in depth and do a bit of other stuff. (The other stuff turned into a bit of dabbling in typing lessons and Word document formatting.) The classes themselves were grades 6 and 7, with probably the widest range of demographics in our district. I started with the Scratch Curriculum Guide Draft. It outlined a 20-class unit with a mix of smaller one-class assignments, group work, and building up to a longer student-driven project in the end. Going in, I had only a rough idea of what to expect from middle school students in this area. I had taught a similar Info Tech course to high school students using other tools (one with Storytelling Alice, another with LabView and Lego Mindstorms) and I expected a wide range of ability and comfort levels. However I wasn’t sure how long it would take Gr6-7 kids to complete the assignments outlined, so I just dove in and found out the hard way. I did not try to stick tightly to the guide’s schedule, though, as I was already kind of disrupted for timing due to only starting a couple weeks into the school year and not quite having 20 classes left in the first semester by the time I got things rolling with Scratch. In the end the run of Scratch assignments ended up being an intro day of “make a scene with the sprites”, the Dance Party, the Automatic Drawing (later in the year coupled with a make-your-own-paint-program variation), a 1-day Make A Maze walkthrough (later coupled with another 1-day Make A Platformer walkthrough), and then a bunch of time given to their ‘Final Project’. The big Final Project thing turned out pretty fantastic. Kids could work solo or in pairs; I had a few groups of three in my first semester and it generally didn’t work well, due to Scratch not really being made for multiple-computer group work. They kept a basic, guided Design Journal with a couple of introductory planning pages followed by a simple “What did you work on today? Did you have to change your plan? What are you working on next class?” sort of prompted daily log. The level of technical skill that students showed was all over the map, but nearly everyone found something they were inspired to make and got excited about it. Horse races, skateboarding, messed-up fairy tales, mini RPGs, and a lot of platformers and mazes. And everyone got a taste for what it’s like to plan and implement a large-ish creative project. I did not try to do anything as ambitious as SBG, despite my love for the system. I didn’t have set PLOs, I didn’t know how far was too far to expect them to go with abstract coding concepts, and after a couple of months I realized that I wasn’t there to teach programming anyway. I was there to teach kids that “creativity” just means creating which just means go out there and make stuff, and that computers aren’t just a passive media consumption tool. Exposing them to coding along the way was a bonus but I wasn’t going to expect them to fully wrap their minds around all of the ideas that they were playing with in Scratch. Next time around, we’ll see. I know what’s reasonable to expect of students at that level now, and I am a bit dissatisfied with how loosely I was grading things. However, I’m still running a spectrum of learning goals across both arts and tech (and waiting to find out what next year’s schedule will look like for me) so I’m not pinning things down too specifically yet. The plus side: I got to basically do all the fun stuff with kids and didn’t have to hammer them over the head if they didn’t really get the deep implications of how the event system works in Scratch or whatever. A small code-reading and debugging assignment: what does this Scratch code do? If we want it to do this instead, what do we change? Giving exposure to programming to middle school kids is easy. Actually expecting and assessing for mastery over any of those concepts is another matter entirely. The Scratch Curriculum Guide Draft is fantastic, but don’t be afraid to adapt like crazy. If you have a lot more time than 20-30 hrs to spend on a middle school course using Scratch, you could probably expand on the draft curriculum guide above by breaking things apart into 2-3 themed “Big Projects” instead of just one. Maybe choose a focus based on the areas mentioned in the guide – Story, Arts, Games – and choose which technical skills you’d focus on for each (but expect some required overlap). Alternately, maybe detour into other accessible coding languages / environments. I had at least a few grade 7 kids already trying to build things in GameMaker without my help; it’s a great game creation tool, not a great first tool for actually teaching coding but might be a great extension. I love Processing and tried the briefest of introductions with a couple of advanced students, but didn’t give it a fair go to say whether it was a win. My only takeaway from that was that you can’t just give a middle-school kid something like sketchpad.cc and expect them to get far on short notice without some help. Installing the actual Processing IDE would probably have been better. With the official release of Scratch 2.0 near the end of the school year, I let some kids give it a try and had a number of them use it for their big Final Project. Build your own blocks! …except I did not take time (or really have much time) to help build up kids’ understanding of how powerful this is. The interface for this is pretty good, but definitely not obvious to kids just testing it out on their own. Sprites now have direct access to changing the background – no more message-passing ‘broadcast’ blocks required. Web-only model is NOT conducive to helping kids w/ access to their files. The old downloaded Scratch saves files in an obvious, expected location, and when a kid needs help getting at a group project that was saved on a missing member’s login, I had admin access to fix that. On the web version, that kid is now wasting a class. The interesting thing about this question is that it is quite clear from the several early papers that it was an ancillary point for the Dynabook to be able to simulate all existing media in an editable/authorable form in a highly portable networked (including wireless) form. The main point was for it to be able to qualitatively extend the notions of “reading, writing, sharing, publishing, etc. of ideas” literacy to include the “computer reading, writing, sharing, publishing of ideas” that is the computer’s special province. For all media, the original intent was “symmetric authoring and consuming”. Isn’t it crystal clear that this last and most important service is quite lacking in today’s computing for the general public? Apple with the iPad and iPhone goes even further and does not allow children to download an Etoy made by another child somewhere in the world. This could not be farther from the original intentions of the entire ARPA-IPTO/PARC community in the ’60s and ’70s. I’ve used the analogy of what would happen if you put a piano in every classroom. If there is no other context, you will get a “chopsticks” culture, and maybe even a pop culture. And this is pretty much what is happening. In other words, “the music is not in the piano”. Mindstorms, LOGO and Scratch: What happened to procedural thinking? One of the key ‘powerful ideas’ that comes up in Mindstorms is the idea of procedural thinking. I can’t recall if Papert uses this phrase, but what I mean by it is, being able to think about a sequence of actions and break it down into smaller sub-procedures. This is a fundamental practice in computer programming, although in modern object-oriented programming it also extends to grouping a problem’s set of data and procedures into smaller subdomains called ‘objects’. Still, with or without objects, writing your own procedures (or functions or methods or whatever they’re called in your language of choice) is how we take the massive task of “Do this huge set of actions” into smaller parts that the programmer can wrap their brain around at once. In LOGO this is done by essentially defining a new word: “TO DOTHIS” would create a new verb, DOTHIS, in the sense of “To do this thing, you should …”etc. Papert extends this idea into the realm of a metacognitive “powerful idea” in a few different directions. Once someone has the idea of breaking down a complicated task into smaller, “mind-sized bites” (in the words of a grade 7 student quoted in the book), they can apply this to other complex tasks outside of computing. Papert even extends this to physical education with a research study done by one of his colleagues on teaching students to juggle, breaking it down to smaller sub-skills of “TOSS RIGHT”, “TOSS LEFT”, etc. This seems pretty huge. Computing is definitely not the first or only domain where people have understood breaking large tasks down into smaller sub-tasks. But it does provide an environment where students can easily create their own complex tasks and wrestle with the complexity. This is, I think, pretty unusual – in most areas of life, the challenge of a complex task is primarily in actually doing things. In computing, we are scripting commands and the computer does all the “doing” for us. So in effect the challenge of “doing” is removed, leaving only the challenge of wrestling with exactly what to do. Students experimenting in a rich computing environment will end up discovering the problem of managing complexity as a natural effect of playful building, and won’t mistake this for a problem in how they are “doing” the tasks. Okay. This is all great, seems like an obvious win for creative computing education. So why did Scratch leave this out? In Scratch, kids do get exposure to a pretty nice laundry list of advanced computing concepts: events, parallel programming / threads, objects, variables, lists, and plenty of I/O options. 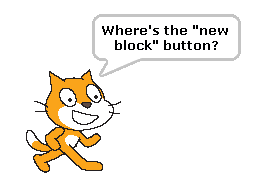 But Scratch left out the ability to create new “procedures” or blocks. This omission was glaring enough that a separate project branched off from Scratch with the sole purpose of adding this feature (initially called ‘BYOB’ for Build Your Own Blocks, now rebranded as Snap). The fact that there’s an “advanced” version with this ability is great and fills the gap. I’m not really arguing whether they should or shouldn’t have included that in Scratch in the first place. I’m just kind of startled to realize how weird it is that they left it out. Procedural thinking seems to be the biggest advantage, the most important “powerful idea” that Papert sees in introducing kids to computing. I’m sure this was left out on purpose. I just wish I knew the reason why. In LOGO, allowing a student to create a new verb was relatively natural. Was this concept too hard to integrate into the visual model for the UI in a way that younger students would understand? Or was this tool seen as adding too much complexity – despite the fact that it exists precisely to reduce complexity?